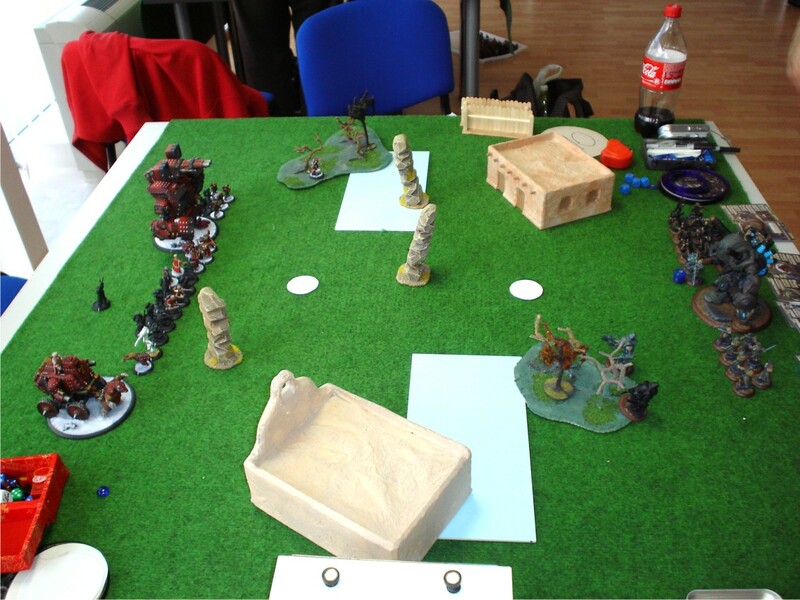 To give you a rough idea of our little group: S’tan owns 4 factions (Cygnar, Menoth, Skorne and recently added Legion) and is the strongest ‘power player’ in our meta, Weef plays Trolls (and recently got into Retribution) and is the most calculative player we have (master of theory machine and ‘min-maxing’), while I am the ‘artist’ of the group, who just happens to have a good memory for stats, rules and math. By comparison with the MoM crew, S’tan is our version of Keith, Weef is our Phatasian and I am an ‘artsy’ Crump (I guess that would make me ‘other Crump’, if I am not mixing up podcast crews). I won the dice off and opted to go second to choose the side with the smaller building in the way and get first blood (since he had to advance into the range of my guns first). As I expected he placed his Strike force and Ayanna across from my Conquest, while his sentinels faced my Gun carriage (probably relying on their armor 17 to weather my pow 7 blast). In his first turn my opponent pretty much ran his force forward, spreading the Strike force out on my left flank, toeing in the zone with the AFG and maneuvering his Quickened sentinels around the building in front of his deployment, while keeping Ossyan and Hypnos centrally. In response Vlad cast Signs & portents and hid completely behind the small building on my side of the table, while Eiryss stripped off Quicken from the Sentinels and then Ayanna and Holt with Zephir put Harm on the unit and shot off 2 other grunts from the unit. From there I blasted the front ranks of the unit with my battle engine, to leave the rough terrain in their path to me and shifted my unit of Rifle corps to my right flank and pepper the survivors with rifle fire, leaving only the Officer and standard alive. On the other flank Conquest advanced with his retinue of mechanics and managed to scatter his main cannon’s blast on the opposing Ayanna and Holt, killing them off and put down his 4 covering fire AoEs to impede the advance of the Strike force. On his second turn, Ossyan put Shatter storm on the AFG and Admonition on Hypnos. The Ret battle engine used its Multi fire shot to kill half of the Rifle corps, Hypnos advanced to try and shoot my colossal, but ended up short and the rest of the force maneuvered around my various AoEs. This turn I made Hypnos my highest priority target, so Vlad cast S&P again, Ayanna Harmed the enemy character myrmidon and the combined fire from Conquest, Rifle corps and the battle engine finished it off, along a Mage hunter assassin and a few more Strike force members. On turn 3 he cleared out most of my remaining Rifle corps, a couple mechanics and put a few points of damage on Conquest, while using his last 2 sentinels and Mage hunter assassin to engage Ayanna, Eyryss and the Gun carriage on my right flank. At this point Vlad gave 3 focus to Conquest, popped his feat, cast Blood of kings and advanced around the building into the zone, to kill the Sentinel UA (and cast Wind wall due to Blood boon). Ayanna Harmed the central objective, so that Holt and Gun carriage could scrap it and clear the charge line to the enemy battle engine. The AFG can’t be charged, but there was a Strike force grunt in the zone close to it, so Conquest charged that to get in melee with the enemy battle engine and trash it, clearing the zone and allowing Vlad to dominate. At this point my opponent was forced to throw everything he had left in the zone to contest (due to Wind wall the Strike force was otherwise useless) and sent the Aspis after Vlad in a last ditch attempt to salvage the game, but couldn’t hit defense 18, so in my last turn I cleared out the contesting models from the zone with my Greylords and remaining solos, while Conquest squished Ossyan with his initials, so that I could score 2 more control points at the end of the game, after getting the assassination. I won the roll off and chose to go first this time, to push the line of engagement in his half of the board and limit his ability to ‘yo-yo’ his heavies with eKaya’s feat. As you can see in the picture we both deployed centrally with our respective AD units spreading a bit wider on the front. In my first turn I rolled 4 focus, cast Fury on the MoW Drakhun, charged Butcher forward and positioned the Drakhun to countercharge anything that tried to get into the zone or near my caster. Since he deployed his druids on his AD line, my Widowmakers advanced and were able to snipe 3 off before they could drop down their clouds, while the rest of my army pretty much ran forward. On his turn the opponent cast Shadow pack and Forced evolution on the Stalker on my right flank and cautiously advanced his battle group with the Satyr threatening counter slams like my Drakhun. His Lord of the feast charged and threshered 2 Doom reavers, shot his crow at another to teleport there and killed a few more reavers and a Great bear with the heart tokens gained. Finally his stones and druids repositioned to be in the way of my charges next turn. On turn 2 I rolled only 2 focus, but got to upkeep Fury on the Drakhun for free, due to ‘Wishnayler’ and since the Lord of the feast was within Madelyn’s command I got to move Orsus 3’’ forward before his activation. Now my main problem was that I had to use my feat now, since my opponent was quickly running out of infantry I could kill to get Rage tokens, but his Satyr could counter slam me away, if I wasn’t careful. With that in mind I first ran up my Drakhun so that if the big goat tried counter slamming me, I would get to counter charge it with a P+S 17 weapon master and ran Kell Bailoch in its path to create a ‘safe zone’ where the Satyr couldn’t slam back Butcher. 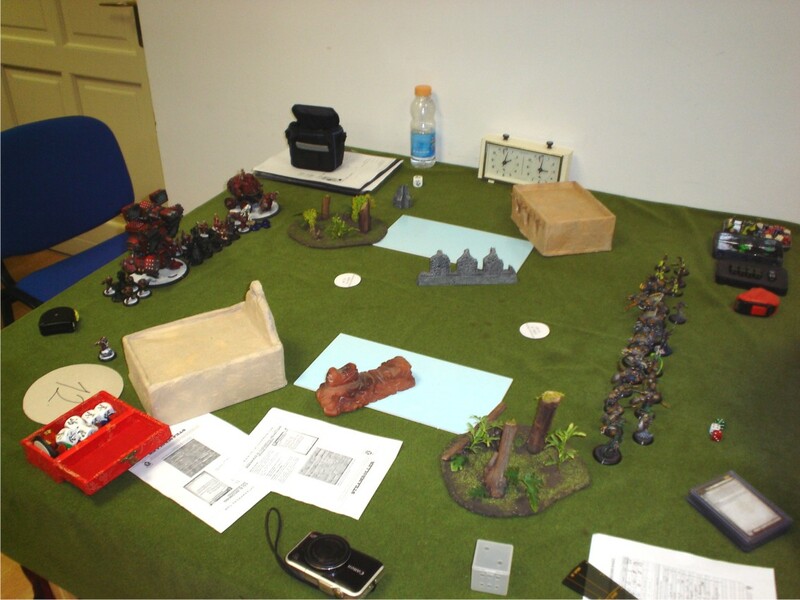 Once that was taken care of I popped the feat and charged Orsus at the druid officer on the edge of the scenario zone to trigger Conferred rage for Beast 09. The Doom reavers charged and destroyed the closest Shifting stone and clogged up the Stalker on my right, the Widowmakers cleared out the few druids contesting the zone and the Great bears dispatched the Lord of the feast, while Beast, Fenris and the support staff all ran forward. This way I got 5 rage tokens that I gave to Beast and the Drakhun to kill the Satyr, put some damage on the Pureblood and prevent the opposing beasts from getting to Butcher. In response he dedicated all his beasts to destroying Beast 09 and the MoW Drakhun and placed a few clouds with the 2 druids left. In my third turn I fortunately rolled up 7 focus, used Madelyn’s Intrigue move to get Gorman closer to the buffed Stalker and Black oil it by targeting a shifting stone next to it. 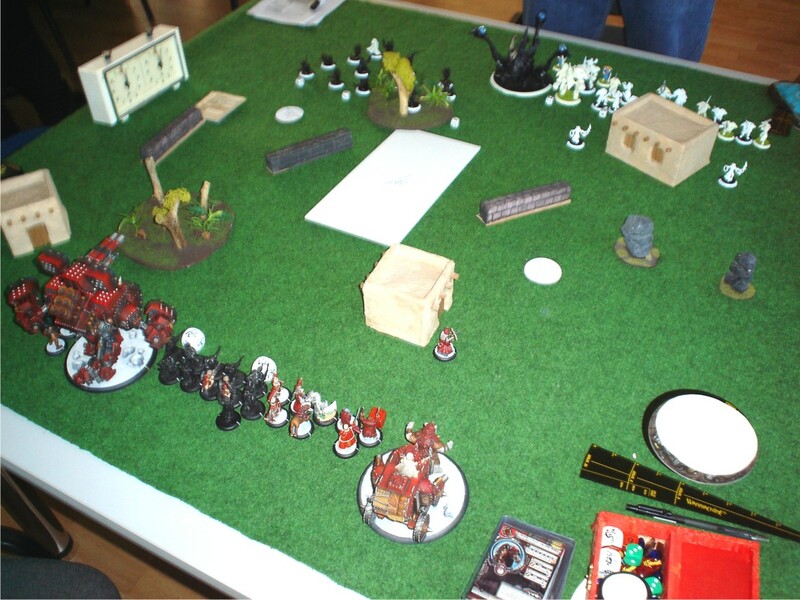 Then I just charged the Butcher into the Pureblood and Gorax, that killed the Drakhun, dispached them with 2 focus to spare and used the 1’’ move from Homicidal maniac to toe back in the zone. The surviving Doom reavers charged and slaughtered the black oiled Staker and caused the last few druids and Wilder to fail their abomination checks, leaving only Kaya and Laris able to do anything next turn. Finally Fenris ran to engage Kaya and her beast to make it difficult to get to butcher and I scored 2 CPs at the end of the turn. At that point the opponent tried a hail Mary assassination attempt on Orsus by moving Laris around Fenris (the free strike stripped its mind, so he didn’t manage to hit Butcher) and teleporting Kaya next to it through Spirit door. With the flank bonus she managed to do 14 damage to my caster, but had nothing to contest, so I got another 2 CPs from dominating the zone at the end of his turn. On turn 4 I got automatically 7 focus (since the Butcher killed 3 models in melee the turn before) and personally trashed both Laris and Kaya before dominating again at the end of the game for 6 CPs in total. The opponent won the roll off and chose to go first, so I picked the side of the board with the bigger forest, so that his Nyss would not get it (they are annoying enough without it). On turn 1 the opponent pretty much just ran everything forward, spreading out his Nyss to try and limit the impact of my AoEs, while hiding some of the Arcane tempest gun mages and a Hunter behind the building on my right flank and hid Haley completely out of sight behind the forest. In response Vlad cast S&P and hid behind the column in front of my deployment, while the battle engine trampled forward to get line of sight around the corner of the building and blasting 3 Gun mages and putting some damage on one of the Hunters, while the Rifle corps inspired by Griegorovich’s speech shoot off another 3-4 Nyss on my left flank and Conquest just fired off his main cannon blasting another 2 Nyss and put down covering fire templates to prevent the rest from just advancing into my limited maneuver space between the columns and objective. On her second turn pHaley struggled through the forest to toe in the zone and feated, concentrating the fire from both Hunters and Gun mages into my Gun carriage to scrap it, used the remaining Nyss to kill off 4-5 or my Rifle corps, while Murdock mini-feated to make them immune to blast damage and fired off Stormwall’s main cannons at my Conquest doing about 8 damage. On my turn I started advancing Vlad toward my zone (but didn’t quite reach it yet), while casting S&P and giving focus out to Conquest. Conquest advanced at fired off its main cannon at the enemy objective, scoring a critical and clipping Murdock and another Nyss with the AoE. Admittedly he and the Nyss are immune to blast damage, but with the critical Devastation they get thrown and it becomes regular collateral damage that they can’t ignore, so Murdock died. The mini feat lasts for a round so I used my secondary guns to chip away damage boxes from the objective but left it at 3 health boxes. The rest of my force started shifting toward Haley’s zone to try contesting next turn, while peppering the last few Nyss and the closest Hunter with rifle fire and magical sprays, damaging it quite a bit. At the end of the turn Haley dominated her friendly zone for her first CP. Turn 3 Haley just advanced a little to catch more stuff in her control area and cast Temporal barrier. Stormwall moved in the way to screen her and fired off more cannon shots into Conquest for another 10 damage points, while the Gun mages and hunters killed off my infantry models that might be close enough to contest even under TB and Haley scored another CP by dominating her zone. I responded by charging Vlad into my zone, used Eyriss, aiming Holt and few surviving Rifle corps to finish off the last Nyss, while Conquest advanced toward Haley’s zone, going between the column and my objective, finished off the enemy objective with one of his secondary batteries and focused his remaining firepower on the damaged Hunter to scrap it. I tried running Griegorovich and the last Greylord into the zone (since they started out of Haley’s control), but ended up half an inch short, so we both dominated our own zones and got respectively 2 vs 3 CPs in his favour. I have to admit that at this point I though the game was over, since my opponent could score 2 CPs on his turn and win the scenario. At the start of his fourth turn he spent a few minutes doing calculations and finally decided that trying to blow up the objective just with Stormwall’s guns was too dicey (could not just charge it since Conquest was in the way), so he opted to advance his Stormwall in base to base, pinning my colossal against my own objective, to prevent him from advancing 8’’ under Vlad’s feat to finally contest Haley’s zone next turn, he also punched Conquest a few times doing some damage but mainly trying to get electro leaps onto the Mechanics that were following it around repairing the damage he suffered from shooting each round; unfortunately the Objective was the closest model so all the leaps went into that without doing any damage. Obviously Haley recast TB with her last focus points and again we both scored one CP each. So on my turn I had no option of contesting the enemy zone and TB, but Haley had no focus and she was in range of Conquest’s guns. Since my colossal was engaged he could not get an aiming bonus, so I had to bet on Rat 4 boosted under S&P against Def 16 and Arm 14. I started by firing off my secondary batteries (to avoid criticals that could throw her out of range of my other guns) without boosting to hit, but boosting the blast damage and doing 5 points with that, and then hit her with a fully boosted main cannon shot that did another 15 damage and won me the game. In my first turn I ran my 2 huge bases as far forward as possible toward the zones, stuck Vlad in the forest near my zone and cautiously advanced my infantry down the middle trying to stay out of ‘arcnode run + Hell mouth’ range for at least the first turn, while my opponent ran all his incorporeal infantry and solos at me followed by his jacks, while keeping his caster incorporeal and centrally between the zones. On my second turn Ayanna gave magical weapons to the Rifle corps who boldly advanced and shoot off all the Ghost raiders, the Machine wraith and 3 Bane knights, while Conquest and my battle engine advanced in their respective zones and focused their fire at the closest enemy arcnode and scrapped it. In response my opponent ran all his jacks into my zone, keeping Nightmare just far enough from my battle engine that I could not ignore Stealth, charged his caster forward, so that she got behind cover and popped her feat, catching Vlad and most of my army, except for Conquest, Eyriss and the mechanics on the right flank. A couple of Hell mouths killed off most of the Rile corps (who failed their morale check) and Greylords. At that point I panicked a bit, since next turn he could get Nightmare on Vlad, I could not move back and in the heat of the moment I did not see any good way to stop the assassination attempt on Vlad (we’ll discuss what I should have done later…), so I went for a Hail Mary long shot. Denny was corporeal this turn and had no focus on her, so Vlad gave focus to Conquest, cast S&P and popped his feat. Griegorovich used his Fearless + Tough speech to rally the last surviving Rifle corps, whom cleared out the Bane knights standing in Conquest’s path and managed to scrap the last working arcnode system from the third Defiler. My Battle engine just aimed and shot its cannons at the Slayer standing between Nightmare and Denny, hoping to disable its movement system (so that its defense would drop to 7) and to put some blast damage on Denny (I think I did around 4 wounds to her this way). Lastly I advanced Conquest 8’’ to try and get a line of fire around the linear obstacle, but alas was a couple inches short from getting a clear shot, so instead of trying to hit Def 20 Denny, I shot the damaged Slayer, praying for a critical hit that would throw back Nightmare, Denny and the slayer, but it was not meant to be. With the boosted blast damage under S&P I managed to put another 7-8 points of damage on the enemy caster, but the secondary guns all scattered too far off her so I wasn’t able to finish her off. In the end Denny survived, gave 3 focus to Nightmare and put Ghost walk on the damaged Defiler, so that it could slam a Rifle corp grunt into Vlad, to knock him down and kill him with Nightmare. Now what I should have done, if I didn’t panic like a school girl, was: Run eEyriss next to the Cryx jacks, to prevent focus allocation next turn, fire the battle engine cannons at Nightmare, hoping for some scatters that would leave 4’’ AoEs of rough terrain in his path, use my few surviving infantry models to kill off my own Shadow bound rifle corps, so that Conquest with Vlad’s feat has a corridor to run 16’’ around my objective and stop next to my battle engine to completely screen Vlad. I am not sure Eyriss was close enough to actually make it to the enemy jacks and even under those conditions the Cryx player had a chance of putting Curse of shadows on one of my huge bases and Ghost walk on Nightmare to get to Vlad anyway, but with the Wardog and full camp, he might have survived… Lesson learned (I guess). In the end S’tan won his game against Weef and got 1st overall, Wolfi (Hungarian Khador player that fought S’tan in an earlier round) got 2nd and Weef ended up 3rd with me tagging behind in 4th place out of 24; much better results than any of us expected at the start of the tournament. Overall we all had a very good time and enjoyed meeting and playing new people, so we will certainly return to this event in the future.I should also thank Loránd Sövényházi, for inviting us, Eszter Polgár and the other organizers and judges, for putting up such a great event.